Try Web Push for Yourself! What are Web Browser Push Notifications? A push notification is an incredible channel to notify users about new updated content on the website, offers or other valuable information. A hassle-free way to reach your users in real time, whenever you want. The push notifications are delivered directly on the desktop and mobile browser. PushAssist is compatible with popular and dominating web browsers, such as Safari, Chrome, and Firefox. Web Push also works on mobiles with Android OS and Chrome. Can I send Web Push notifications on iOS devices? The answer for this question remains 'no' for now. It's only a matter of time when web push will start supporting IOS devices. Few expect to see the new version of IOS web push notification by Q3 or Q4 of 2017. 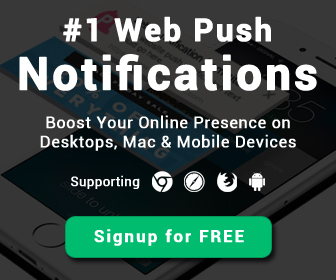 Send push notifications on mobile and desktop. other key features include, Multi Language Support, Auto Segments, Geo Segmentation, Welcome Notification, Scheduling, Email Support and Detailed Analytics. Can I use my account after sending notifications to 3000 users? After you have utilized the limit of 3000 subscribers, you must upgrade your free account to paid one. How to add subscribers to PushAssist? To add subscribers you can send us the list of subscribers at support@pushassist.com. We'll add the subscriber list right away. Subscribers are also automatically added when visitorsb give their consent for push messages. You can get in touch with our support team for more information. Can we use push notifications for multiple devices? Yes, you can easily send push notification on mobile devices, provided users are using compatible version of Android and Chrome. Can I send push notifications on Wordpress Platform. Yes, with the help of our Wordpress plugin you can automatically send a real time web push on publishing a new post. This hard to miss, interactive message is directly sent to desktop and mobile screen. Will I get my subscribers lists, if I wish to migrate to a different provider? For subscriber lists, you must provide us the GCM (Google Cloud Messaging) API Key for Chrome, and Certificate Details for Safari at the time of installation.. If you want to know how to register for a GCM Key, please refer our guides section. I want to ask more questions. What should I do? Please send us your query at support@pushassist.com. Or if you find one of our crew members online on our live chat, please ask them a question. All your queries will be instantly addressed.